Green Chillies .. 2 nos. cloves .. 3 to 4 nos. Heat 1 table spoon oil in a pan. Fry chana dal,til,groundnuts, kaaju, dhaniya(whole), jeera, cloves, dalchini until golden brown ,remove and keep aside. In the same oil fry sliced onion and green chillies. Let the ingredients cool. To it add chilli powder, ginger garlic paste, salt, sugar, haldi, tamarind and make a thick paste by adding sufficient water. Choose tender, small brinjals. Clean and cut vertical slits. Fill the paste in the slits as shown in the picture. 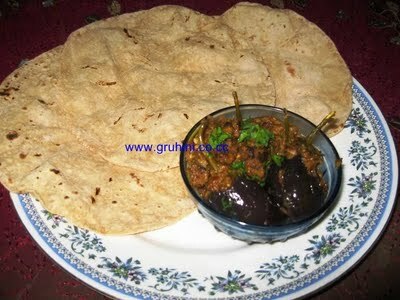 Now heat 2 table spoons of oil in the pan and slowly place the stuffed brinjals in the pan. Cook in a low flame. Stir carefully in between. Cook for 10 to 15 min. until the curry is done.